Let basic be beautiful each time you wear this Bella Dress Black by Jatine. It's made in a fitted style, much like bodycon - only better. It features a scooped back and center back zip with a slit. This dress is simple, chic and on trend with bell chiffon sleeves and an over-the-knee hemline. It can be worn to a ladies luncheon or dressed up for a night out on the town. 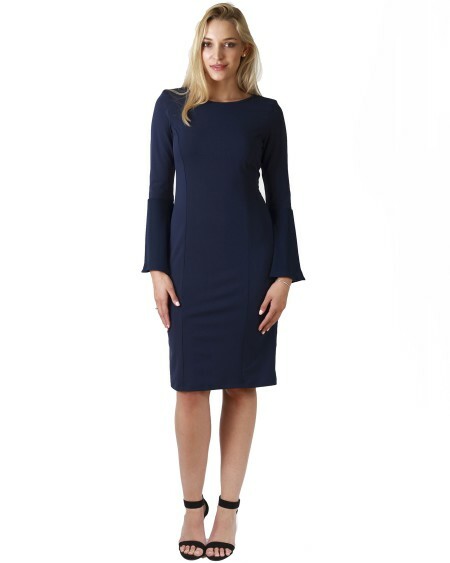 Let basic be beautiful each time you wear this Bella Dress Navy by Jatine. It's made in a fitted style, much like bodycon - only better. It features a scooped back and center back zip with a slit. This dress is simple, chic and on trend with bell chiffon sleeves and an over-the-knee hemline. It can be worn to a ladies luncheon or dressed up for a night out on the town. Paint the town with the Sophia Dress Black by Jatine. It follows the lines of your body, giving a beautiful hourglass shape every time you wear it. It features raglan lace long sleeves with an open back detail that conceals any bra straps. It has a center back zip and center back slit with a hemline that's just over-the-knee. Pair it with a tailored jacket for a corporate day at the office or dress it up with a pair of killer heels for a night out. Paint the town with the Sophia Dress Red by Jatine. It follows the lines of your body, giving a beautiful hourglass shape every time you wear it. It features raglan lace long sleeves with an open back detail that conceals any bra straps. It has a center back zip and center back slit with a hemline that's just over-the-knee. Pair it with a tailored jacket for a corporate day at the office or dress it up with a pair of killer heels for a night out.